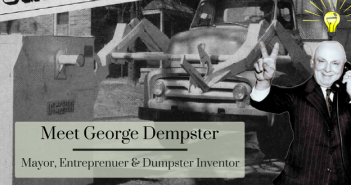 You are at: Home » Waste Industry News » Dumpster vs. Dumpster Bag: Which Is Right for Your Project? 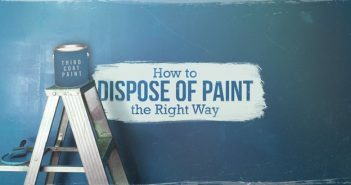 If you frequent your local Home Depot or Lowe’s, then you’ve probably seen a few display stands for disposable dumpster bags. You know, those bags that are advertised as being more convenient and more affordable than a dumpster for home cleanups. 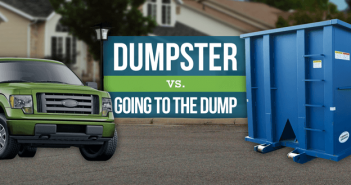 Does the dumpster bag really beat the dumpster for home waste removal? The answer depends on both the scope of your project and your budget. Check out the comparisons below to decide which option is right for you. What Is the Difference Between a Dumpster Bag and a Dumpster? Sizes: One bag size available that holds 3 cubic yards of debris with a 3,300 pound weight limit. Come in 10, 20, 30 and 40 cubic yard sizes, each with its own weight limit. Dimensions: 8 feet long by 4 feet wide by 2.5 feet high. Vary by size. Typically 8 feet wide, 10-20 feet long and 3.5-7 feet high. Placement: Must be placed within about 18 feet of the street. Can be placed almost anywhere in your driveway or on your property. Pickup: Pickup not offered in all locations where bags are sold. Contact the rental company for pickup on or before the last day of your rental period. When considering a disposable dumpster bag, always double-check with the company offering the service that pickups are available in your area. Also be aware that if you place your bag inside your home, or elsewhere outside the 18-foot reach of the truck’s hydraulic arm, pickup will not be possible. When considering a dumpster, estimate the weight of your debris so that you can choose the dumpster size that best matches your needs. The main draw of dumpster bags are the low prices—as low as $29.99 for some brands. But before you make your purchase, it’s important to know that this price covers only the bag itself. An additional fee is charged for pickup. Use this chart to compare cost estimates for each option in various situations. *These numbers are approximate. Research prices in your area for precise information. With these numbers, you can see that a dumpster bag is an economical choice for small-scale cleanouts or minor home improvement projects with less than 10 cubic yards’ worth of debris. However, for any project with 10 cubic yards of debris or more, a dumpster will almost always be significantly cheaper. The concept behind the dumpster bag is an intriguing one. It puts a new spin on an old method, and can be a convenient and economical option for DIYers undertaking very small-scale projects. But for larger-scale projects, it doesn’t match up with the affordability of a traditional dumpster. And whereas a roll off container can be used over and over again, a single dumpster bag is just going to become another piece of trash. So, if you’re asking yourself whether to rent a dumpster bag or a dumpster, the answer for all but small jobs is almost always going to be a dumpster. If you’re considering a dumpster rental, give us a call at 1-866-284-6164 for help choosing the best size for your project. Also, check out our video below for more information on dumpster sizes. Do they keep the bag or empty it to be used again. Or do they take it ? Thanks for commenting Sandy. The company takes the bag when they come for pickup. BullBag leaves the bag for you (either set back up for you to use again, or you can ask them to roll it up for you to use at a later time). I realize that you are selling a service and you want to make the advantages for your services stand out, but you can do that without making misleading comparisons. There is no doubt that for a 30 cubic yard dumpster the economics tilt very strongly in favor of the dumpster. But let’s take another look at your 10 yard basement cleanup, which just happens to exactly fill the 10 yard dumpster but only has one yard in the fourth bagster. Let’s take a fairer example of a nine yard cleanup instead of a 10 yard cleanup. In that case it would require three bags, plus the pickup fee. In most areas there is a savings for additional bagsters picked up at the same time. In my area, it costs $129 for the first bagster and 99$ per additional bagster. So in this case we are now have 3 x $30 + 129 + 2 * 99 = $417 vs $377 for the 10 yard dumpster. So the dumpster is still cheaper, but not by too much. Now when a commercial contractor does a cleanup, they aren’t going to be hanging around for weeks or months working on the cleanup, so the 7 – 10 day limitation is great for them. When a homeowner is working on a project it’s much more likely to extend way beyond 7 – 10 days. If you consider that the typical person is going to want to keep the dumpster for longer than the default period, and that the typical dumpster is going to cost an extra $10 per day then I think the economics favors the bagster for a 9 yard cleanup, instead of the dumpster. For any larger cleanup, clearly the dumpster has an advantage over the bagster, although not as much as your chart shows because you omit the discount for multiple bagsters being picked up. Thanks for commenting and pointing out the discount for picking up multiple bags – that was definitely an oversight on our part. We’ll be updating the post to include that information and make more accurate comparisons. Thanks again! Did you have to place it in the street or could I put it in my driveway in the back of my house?